I think when this is used you should have to arrange the success tokens in the shape of the sign. This seems like it will be quick to trigger - if you use it with the 4 terror struggle conspiracy then 2 turns is possible. As pointed out by VonWibble, with the right conspiracies out, this can be a major threat. Magical Theorist with a couple of tomes around (King in Yellow folio, for even more terror struggles) can also pump tokens on it in no time, and ST Carl Stanford will fetch it from your discard pile right after for another round. The wording suggests to me that you can't just win the terror struggle. Your opponent has to be at the story in order to lose the struggle, correct? I was going to pair this up with The Door That Will Not Close in order to make my opponent pay for not committing to said conspiracy, but I don't think it works the way I'm wanting. It is possible for a player to win an icon struggle even when his opponent has committed no characters, or characters with that icon, to the struggle. For example, a player would win a @ struggle if he had committed any characters with one or more @ icons and his opponent had committed no characters. Thing is, Drawing the Sign doesn't refer to "winning" the struggle, quite the contrary, actually. 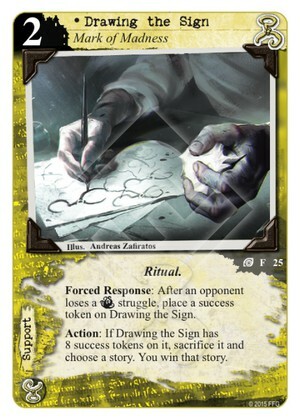 And since the wording of the new Hastur is "When you win a T struggle", I think this differentiation is quite deliberate and I wouldn't put tokens on Drawing the Sign if I go unopposed. Kwakkie is correct. Your opponent does not need to turn up for you to gain success tokens with this card. If you win a struggle, your opponent loses it. As a language issue, the game tends (unreliably) to use "win" for beneficial effects and "lose" for detrimental ones, but every struggle that isn't tied has a winner and a loser. Thank you, Richard. Insightful, as always.